Fig. 5. (A) Comparison between a proxy of solar activity (blue) and a proxy of temperature (δ18O) from Dongge cave, China, (green) representing changes of the Asian climate during the Holocene. The two records are evidently well correlated. (B) Comparison between the global mean tropospheric temperatures (blue) and the galactic cosmic ray record (red), which is modulated by the solar magnetic activity. The panel shows the match achieved after removing El Nino, the North Atlantic Oscillation, volcanic aerosols, and also a linear trend from the temperature record: the finding is consistent with Refs. [11,19]. (C) Observed temperatures versus the SCL121 solar cycle length model. (D) Annual-mean equator to pole gradient over the entire Northern Hemisphere (blue) and its smoothed 10-year running mean (dash blue) versus the estimated total solar irradiance (red) of Hoyt and Schatten  (red, with up dates by ) from 1850 to 2010. (E) Comparison of the Belukha (Siberia) temperature reconstruction with solar activity proxies. 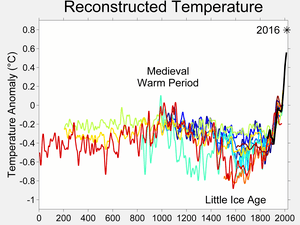 (F) Temperature reconstruction for the Central Alps over the last two millennia, obtained from the δ18O composition of a speleothem from Spannagel Cave versus the variations of cosmic rays (∇14C) and CO2 over this period. (For interpretation of the references to colour in this figure legend, the reader is referred to the web version of this article.) Source: (A) adapted from Steinhilber et al. ; (B) adapted from Svensmark and Friis-Christensen ; (C) adapted from Thejil and Lassen , cf. with Thejil ; (D) adapted from Soon and Legates ; (E) adapted from Eichler et al. ; (F) adapted from Kirkby . The paper has an extensive bibliography and shows the ease with which the solar-planetary theory is beating all the opponents who forecast with models based on atmospheric radiative theory, as well as those opponents who have nothing to offer at all apart from misleading criticism and ad hominem invective. You know who you are. In conclusion, the claim that the global surface temperature record is a fractional random signal fundamentally different from the harmonic nature of the astronomical signals is not supported by the data and careful analysis. 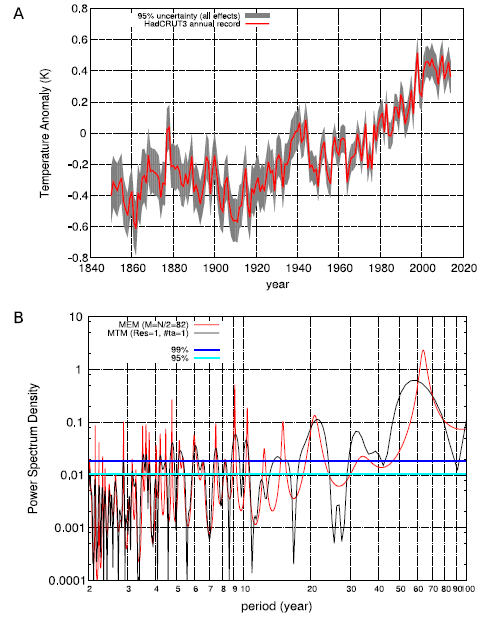 The global surface temperature record appears to be made of natural specific oscillations with a likely solar/astronomical origin plus a noncyclical anthropogenic contribution during the last decades. Indeed, because the boundary condition of the climate system is regulated also by astronomical harmonic forcings, the astronomical frequencies need to be part of the climate signal in the same way the tidal oscillations are regulated by soli-lunar harmonics. Congratulations Nicola on getting another paper into print supporting the possibility of an outside influence on the Earth’s climate. Nicola may be be able to fill us in on the details but I note that the MEM power spectral density plot has peaks that are near to 20.3 and 62.0 Perigee/Syzygy lunar tidal cycles and the 9.3 year half Draconic cycle. (0.5 synodic months)/(12.5 synodic months – tropical yr) = (14.7652944 days/3.890171 days) = 3.796 yrs. In addition, it can be shown that multiples of half of the lunar synodic cycle (Msf) are almost exactly equal to whole multiples of a year, for 4.0 years, 4.0 + 4.0 = 8.0 years, 4.0 + 4.0 + 3.0 = 11.0 years, 4.0 + 4.0 + 3.0 + 4.0 = 15.0 years, and 4.0 + 4.0 + 3.0 + 4.0 + 4.0 = 19.0 years. Hence, spring tides that occur on roughly the same day of the year follow a 4:4:3:4:4 year spacing pattern (with an average spacing of (4 + 4 + 3 + 4 + 4)/5 = 3.8 years), with the pattern repeating itself after a period of almost exactly 19 years. The 19.0 year period is known as the Metonic cycle. This cycle results from the fact that 235 Synodic months = 6939.688381 days = 19.000238 Tropical years. (0.5 draconic months)/(13.5 draconic months – tropical yr) = (13.606110 days/2.122791 days) =6.410 yrs. Unfortunately, when a lunar node realigns with the Sun on roughly the same day of the year, the Moon is no longer at the same lunar phase. In order to have a lunar node realign with the Sun on the same day of the year, and for the Moon to return to the same phase (e.g. New/Full Moon) as well, it would take a period of time set by the beat period between 3.796 and 6.410 years i.e. 9.308 years. This means that if a New Moon takes place when one of the lunar nodes points at the Sun, 9.31 years later, a Full Moon will occur when a lunar node points at the Sun. Thus, the spacing between draconic spring tides is 9.31 years, a period equal to half of the 18.61336 year Draconic lunar cycle (= 9.307 years). Technically speaking, Draconic spring tides do not fall exactly on the same day of the annual seasonal cycle. However, they do take place within +5/-4 days either side of a given date (with an average absolute difference of only ~2.6 days), so they can be considered to be quasi-peak seasonal tides that take place on roughly the same day of the year, once every 9 or 10 years. (0.5 anomalistic months)/(13.5 anomalistic months – tropical yr)=(13.777275 days/6.7442337 days)= 2.043 yrs. Unfortunately, when a lunar apogee realigns with the Sun on the same day of the year, the Moon is no longer at the same lunar phase. In order to have lunar apogee realign with the Sun on the same day of the year, and for the Moon to return to the same phase as well (so that the opposite lunar phase occurs at lunar perigee), it would take a period set by the beat period between 3.796 and 2.043 years = 4.424 years. roughly the same day of the year once every 4 or 5 years, in a sequence that repeats itself every 31 years e.g. (5 + 5 + 4 + 4 + 5 + 4 + 4)/7 = 4.429 years. The reason for the 31.00686 year repetition period is the fact that 383.5 synodic lunar months = 11324.980825 days is almost exactly equal to 411.0 anomalistic lunar months = 11324.92000 days. The difference between these two cycles is very small, amounting to only 1.46 hours over the 31 years. There is also another near coincidence in that 27.5 anomalistic lunar years = 11324.071832 days, ensuring that if a New Moon occurs at closest perigee, 31 Tropical years later, at almost exactly the same time of the year, a Full Moon will occur at closest perigee. a) A New or Full Moon re-align with the Lunar nodes and with the seasons every 9 or 10 years. b) A New or Full Moon re-align with the perigee of the lunar orbit and with the seasons every 4 or 5 years. Hence, it wouldn’t be surprising if the long-term average was ~ 9 years. 89 J-S does look good. The problem is that the position of the J-S conjunction only moves 2.7 degrees of longitude past 240 degrees and for 89 J-S to be the full cycle it’d have to be 4.044 degrees. This is a puzzle I haven’t found the answer to. Ian comments are interesting. I will think about. The problem with so many postings over this site is there is a lack of understanding of noise in the climate system, thresholds in the climate system ,lag times in the climate system and that the climate system is non linear and never in the same state.
. Solar variability and the associated primary and secondary effects. Lag times, degree of magnitude change and duration of those changes must be taken into account. Further because of these points no climate model or method is going to work in predicting a specific climatic outcome. .
At best all that will be accomplished are general trends in the climate of the earth. Climate cycles a tool but not the definitive predictor . To many unknowns and one can spin anything to make it look much more convincing then it really is. My prediction the temp. response will be lower because solar activity went from very active conditions in general prior to 2005 to very quiet conditions in general post 2005. That simple. How much of a change will take place in the climate will depend upon the degree of magnitude change of solar activity and duration of time of the change in solar activity , this current prolonged solar minimum results in. I have listed my solar criteria I will post it again. IF , these average solar parameters are the rule going forward for the remainder of this decade expect global average temperatures to fall by -.5C,(my guess) with the largest global temperature declines occurring over the high latitudes of N.H. land areas. A good listen. I subscribe to this view highly. I disagree 100% with the part of the statement which says plus a noncyclical anthropogenic contribution during the last decades. There has been zero anthropogenic contribution and this fact will be realized as we proceed later into this current decade. Past history shows this to be the case when climate variations were far greater then the begin .8 c rise over the last 100 years which by the way correlates to a vey large increase in solar magnetic activity during that same time span. Sunspot data I don’t even use since it is so subjective and so many different sets of data exist. I much rather use the AP index, or solar flux to get true values of what is going on with the sun. OB: I’ve sussed it. The 89 J-S is only 2/3 of the full cycle of precession. so the full cycle must be around 2660 years. Half of which is 1330. OB: Not so fast. It’s kind of tricky. 1767 is 240 degrees but we need to do 720 altogether for the ‘full precession’. So rather than 1.5×1767, it’s 3×1767. But I reckon it doesn’t matter so much which ‘star point’ of the three is back at the start position. The oddity is that after 89 J-S, both J&S have done full sidereal orbits, but the precession is 240 degrees, not 360, so they are not at ‘full orbits’. I’m still trying to get my head round it. OB: It’s a tricky one. What’s happening is that J-S are doing a Michael Jackson ‘walking backwards while walking forwards’ moon-walk number. That’s how you end up with a full number of orbits at 89 J-S despite the 240 degrees of precession in 1767 years. Go to 48 seconds in this clip to see it in action Nah, watch it fro the start. Is that Slash playing guitar at the start?? Are folk starting to get cycles/time as different than time? The whole universe is cyclic but likely never to repeat. Nice to have something to scratch ones head (or other parts) about. What a wonderful planet! Changes in UV radiation of 6 to 8%, and cosmic radiation by more than 5% (only neutrons) in long cycles are sufficient for the gradual cooling of the oceans. How much longer can governments continue wasting our money in the belief that CO2 is a major climate driver? Reported today: the UK answer to your ‘How much longer’ question. Their main conclusion is that the surface temperature may rise between 1.2 and 4C by 2100 at a confidence level of only 90%, with no central ‘best estimate’ such as appeared in previous reports. And the taxpayer is expected to hand over many billions of their hard earned wages on the basis of this highly uncertain conclusion? Nicola’s model includes the 60yr oscillation and is bang on course. Thank you Roger, I do not often comment but I commend all here for swimming against the current and using maths in science in the correct manner. The harmony of the spheres such as you seek will confound the so called experts and will lead to a better understanding of our solar system, the sun our galaxy and the universe. Many scientists in other fields are starting to buck the system against the status quo, the failure of main stream science is slowly becoming an embarrassment to many. Good luck to Nicola his reasoning seems to be a more possible possibility than the AGW crap. All of which dictates logically that man-made additions to trace gases like CO2 have had little to no overall effect on either cooling or warming in the time period in question. Re: Sun spots are Not linear. Leif from his power sunspot graph above has the maximum power peak/ max cycle at 1024 yrs? How do you interpret this graph? The inflection point in global temp change is governed by the end of the schwabe triplet. “The Jupiter /Saturn 60.9 beat is positioned regularly on the 3rd schwabe of the schwabe triplet. 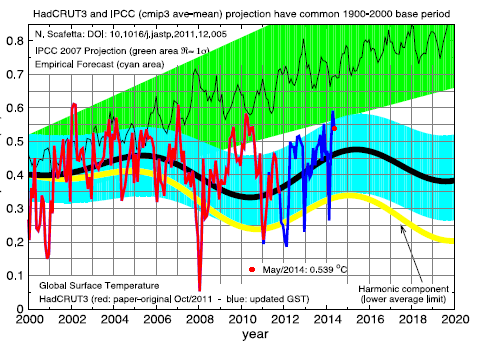 There is a delay of a few years before global temp inflection point for max or min is reached. In early August, the first signs of autumn in northern Europe. The disturbing condition the Gulf Stream. OB: That depends on the slope of the underlying curve and the departures from sine-wave and several other things. TB: 1940-1975 also had overall cooling – looks like the ‘down’ part of the sine wave? Look at the HADCET graph for England: 3 or 4 ‘waves of cooling’ in the last 240 years comparable in size to the solitary big wave of warming, which is obviously over now – per the graph. My friends in eastern Canada also are complaining of cold nights for the time of year. The body feels what the averages as yet do not report. It could be another very cold winter. This winter for the N.H. could be brutal. 1. warm water in N.E. Pacific just like last year. 2. warm water around s. Greenland. The problem is that then Leif concludes that such a finding would disprove the planetary theory. 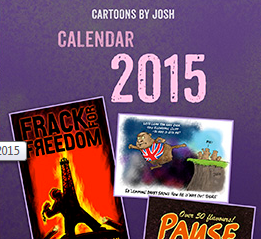 Leif is very funny, as many readers of this blog knows. Let us analyze Leif Model. He then uses a modulation of 1024 year. And finally he uses the ABS function to generate its sub-harmonics. What Leif did not explicitly note was that his chosen basic frequencies contain the planetary harmonics. For example, 60*17 =1020 etc. So his model was artificially constructed to get the planetary harmonics. But how is it possible to simulate the planetary harmonics using such a simple formula? The answer is that the solar system is highly synchronized and all planetary harmonic form a quasi-harmonic sequence. Scafetta, N., 2014. The complex planetary synchronization structure of the solar system. In the Special Issue “Pattern in solar variability, their planetary origin and terrestrial impacts”, Pattern Recognition in Physics 2, 1-19. The first reference suggest a hiatus in the relation between sunspot number and world mean temperature between 1900 and 1945 centered on ~1922. The second reference (i.e. figure 14) suggests a natural hiatus in the lunar tidal alignments between ~1918 and 1964, that is shifted in forward in time by ~18 years from the Keeling and Whorf hiatus. There should be a 8.85-9.3 year oscillation due to the moon. I talk about it extensively in my paper. This oscillation interfere with the solar cycle signature. The two cycles interfere destructively during the period 1920-1940. So, the signal appeared as vanishing. But this is not correct. Copernicus Publications wishes to distance itself from the apparent misuse of the originally agreed aims & scope of the journal as well as the malpractice of not blaming CO2 for Gorebil Warbiling, and decided on 17 January 2014 to cease the publication of PRP. In addition to Nicola’s comments, I will add that the LS synthetic model is based on an incorrect assumption. The model multiplies the cosines of the frequencies 10.81 and 1024 where it is far more likely that the waves that interact in the sun are the results of summations as we usually think of waves interacting, with constructive and destructive interference. The 1024 year frequency manifests from the interaction of more fundamental frequencies driven by the planets. The LS model can be changed into an interacting additive model. The frequencies 10.92533 and 10.69707 reproduce the results of the LS model exactly because of the identity relationship. But now change one of these fundamental frequencies slightly and the model produces a completely different pattern. If 10.69707 is changed by just 1 % to 10.80405 the model morphs into a completely different shape. The planets drive these basic frequencies through modulation. “It doesn’t really matter what the period of the ‘solar’ modulation is.” is wrong. I have a question for Nicola. Is the next your article on the Jupiter-Venus and earth (triad) in progress ? GO Fibonacci. If you cannot find one, you are not trying! Specific humidity: 300 hPa, 500 hPa, 700 hPa, 925 hPa. Absolute humidity is the total amount of water vapour present in a given volume of air. It does not take temperature into consideration. Absolute humidity in the atmosphere ranges from near zero to roughly 30 grams per cubic meter when the air is saturated at 30 °C. The increase in humidity at the level of clouds, the decrease in the upper troposphere. Absolute humidity in the atmosphere ranges from near zero to roughly 30 grams per cubic meter when the air is saturated at 30 °C. OK at altitude, at -30 °C. and at whatever volume, how many grams are left at saturation? Where did the other grams go? Where did the latent heat at 2500 J/gm go? the beat harmonics between the 9.93 Jupiter-Saturn spring tide period and the 11.86 year Jupiter orbital period ? Why is the 66 yr power spectral peak the strongest in the temperature record? This is 6 schwabes. = one up ( 3 schwabes) ,AND one down (3 schwabes)phase of the AMO , which is one cool and one warm phase ..which ~ cancels out ? What exactly is the power spectral band showing? and with your additive model a cycle of 2067 yr which also peaks constructively in the 1900’s? I am a bit confused about synthetic cycles and real cycles? Is it ‘real’ that both the additive and multiply models constructively overlay to produce a constructive decline until 2400? or are saying the solar system harmonics have a natural shift that changes the pattern over time and hence repetition never occurs exactly? Apologies for my lacking here. The 10.81yr period is not the Schwabe cycle length. Nicola says in his 2012 paper that this is a fundamental internal oscillation period generated internally by the Sun. “Kepler’s third law states: The square of the orbital period of a planet is directly proportional to the cube of the semi-major axis of its orbit. Any alternatives to Leif’s solution? is there binary in the solar system? like there is phi? 1/14 —- 0.0714285714285… 0.0001001001… 1/16 + 1/128 + 1/1024 . . .
1/15 …….0.0666… 0.00010001… 1/16 + 1/256 . . .
1/16…….. 0.0625 or 0.0624999… 0.0001 or 0.0000111… 1/32 + 1/64 + 1/128 . . .
We can then multiply that result by the orbital distance ratio of 0.545 we calculated to obtain.. I find the match with Dr Scafetta’s 10.8yr as intriguing! There’s no going to sleep in this forum!! Where are their ( J , S) positions on the increasing sunspot slope ( phase of about 10.8 / 2 = 5.4 yr) and where are they ( J , S ) on the turn off the sunspots slope. Down phase of the schwabe? In other words what J , S configuration turns on the sun spots for ~ 5.4 yrs in the schwabe cycle? WC: THE 10.81 YEAR OSCILLATION IS NOT, REPEAT NOT, THE SCHWABE CYCLE LENGTH. Sorry to shout but you ignored this in my previous comment. Timo Niroma demonstrated that the average Schwabe cycle length of around 11.07 yrs is rarely seen in actual solar cycle length. They cluster most often near 10.38 and 11.9 years. These are JEV cycle and Jupiter orbital periodicities. twice Jupiters (2 x 11.862) orbital period and 19.859 years are indeed governing the polar field (sunspot) waveform approximations (as shown at the front page of my website , as far as I know not employed prior to my publication in January 2003. I discussed these numbers with NASA-JPL astrophysicist and solar scientist Dr. Joan Feynman (yes, sister of R.F.) in 2003, she was not aware of any paper or hypothesis previously using such numbers, and offered advice on publication. TB thanks for drawing attention to the Parker spiral graph. Additional numbers (above the coloured dots) give times of the minima as derived from the monthly non-smoothed SSN. Of course gravitational forces are of the essence, controlling orbital factors, but the above separate alignment of the even and odd cycles suggests to me that the magnetic (Hale) 22 year not the SS 11 year cycle is the primary property of the solar activity. It has been noted that the anti-solar group at the WUWT is resolutely avoiding getting anywhere near Hale cycle in the climate data. Chasing dimensionless sunspot number is a waist of time. Sunspot cycles have a distinct magnetic polarity (opposite) on each of two solar hemispheres. Dr. S will say that they cancel each other, but that is not the case for the open solar magnetic flux impacting the Earth. .
Two magnetic polarities are separated by the heliospheric current sheet (HCS), thus the Earth sees only one at any time. How much time the earth spends in each polarity is determined by the tilt angle of the HCS, which is considerably different between even and odd cycles. All Earth’s electrically conducting (from wires to ocean currents) and electrically charged (from clouds to ionosphere) systems differentiate between two solar magnetic polarities. For example when the Earth is swept by the HCS all geomagnetic stations record sharp magnetic spike of one or the other polarity depending on the direction of the crossing. As a consequence, the 22 year cycle is present in both land and ocean temperatures. Here is the NOAA’s L&O temperature anomaly and its spec, with the 22 year component the most prominent one. Apologies to Dr. Scafetta, intention was not to take over the thread, thus I shall not post further unless a specific question is asked. Thank you for you reference to figure 8B in your EE_2013 paper. In this paper you show that the fourier filtering of GST within the period band between 8 years and 12 years compares well with the regression model from 1870 to 2012, i.e. f (t) = h9.1 (t) + h10.2 (t). In other words, the Lunar tides could explain all of the periods in your regression model. with the 22 year component……..
At WUWT avoiding answers. You can see that a complete cycle is exactly 22 years. Vuk: many thanks for the update. Interesting. I fully acknowledge your early recognition of the periods concerned. And don’t worry about contributing your ideas to this thread, it’s open house here. VUK -latest post very interesting. Question do you think it matters which polarity the earth spends it’s time in? Or does it matter just on how much time the earth spends in each polarity in total regardless of the polarity itself? Ren both the north and south polarity fields are the same , both neg. is this not very unusual? Salvatore: the southward component reconnects with the northern magnetosphere. Vuk may remember better than I do the discussion we had with Svagaard about one of the geomag indices (k index?) Which shows correlations from the soithward readings only. The Ole Svagaard was rather a dammit about the “solar wind does not reverse direction along the ecliptic plane!” while the point I was trying to make was the polarity of the incoming flux at the solar poles switches in polarity like a long term (22 year Hale cycle period Alternating Current) where the magnetic flux alternates which poles it inducts into the sun and the solar wind on the ecliptic plane is the flux out at all times. I think this is due to interactions between the greater Galactic fields and the distribution of the solar system mass around the SS barycenter on the Z axis. It may be the homopolar generator effects of the tilt angles of the outer planets planes, being modified as they are closer or further from the GC than the sun, increasing the total accelerating torque they feel (when between the sun and the GC,) in their angular momentum in all three axis. This modulation shows up in the earth’s LOD patterns due to homopolar gen effects. Richard, interesting thoughts, thanks. Did you see the new comments on your page? The Earth is always under the influence of the interplanetary magnetic field. When the leading edge is magnetized north it connects into the earth’s magnetosphere. Heliospheric current sheet is very narrow, transition is a matter of minutes or mostly hour or two. With CMEs the same principle applies, but effect may last day or two, even longer, CMEs are far stronger and faster than solar wind and push it out of the way. Magnetic polarities + & – (read/blue periphery lines), HCS (white line) and a CME (multi-coloured moving magnetic cloud) are best observed from the middle animation in this link . NASA’s statistical analysis shows that in the even solar cycles the sun’s originated MF’s north polarity leading edge is prevailing, while opposite is the case in the odd cycles. In addition the Earth’s core produces it’s own magnetic decadal riple, closely associated with changes in the LOD. Both of these affect strength and behaviour of the ionosphere. Recent NASA’s observations have conclusively shown that there is an electric link between ‘equatorial electrojet’ (an intense ionospheric electric current flowing on the dayside eastwards, along the geo magnetic-equator) and the equatorial thunderstorms. For the moment, it is thought that it is unidirectional from clouds to ionosphere, possible bidirectional effect is not excluded, but currently no evidence is found. Most of the solar energy input is in the Equatorial region (day time) and even minor effect of the ‘electrojet’ on the cloudiness (formation of storm clouds) might provide required mechanism for the sun-climate 22 year (Hale cycle) link. If so, than the LOD- SSN link may be explained by Indian monsoon shifting hundreds of Giga tons of water from the equatorial region to 25 degrees north into the Himalayas. As it happens the previously mentioned Earth’s core ripple is found to be, along with the ENSO, monsoon’s dominant periodicity. The above is the reason for saying: “Chasing dimensionless sunspot number is a waste of time”. David Evans is only partially correct, the 11 year cycle may be suppressed, but only by its own change of magnetic polarity, no factor X required. Strong electric bias in my ideas is most likely result of the ‘occupational’ deviation. Electric charge is worth the mention you give it. “Chasing dimensionless sunspot number is a waste of time”. I believe in your intuition. It is a pity that other researchers do not appreciate that. so from the graph you posted of Vuks’ angle displacement of J_S . I can see the role of the Jupiter__Saturn magnetosphere angle displacement in the HALE cycle which appears to be completely in phase. Astonishing!! but the schwabe cycle only partially evident there with one schwabe = one phase of the angle displacement .. Related to SC length perhaps but not the creation of sunspots in the 5.4 upward phase of the schwabe . “Vukcevic has constructed the magnetic angle displacement of Jupiter and Saturn. I noted that l could see his fast /slow sun model here which occurs in groups of 10 schwabes . Of note is that the angle displacement is ….higher ..in the …even cycles… during the fast ~100 yr phase!! I will leave VUK to explain what he means by a fast and slow sun phase..
A gear shift /Bi speed De Vries? Amplitude of sunspots in the ~100yr cycle l think. Partially correct, since the ’slow sun’ has generally weaker cycles. The idea was result of one of many exchanges with Dr.S, this one re ‘Gleissberg cycle’. Solar gear is actualy related to the ‘spectral block periodicity’ of the principal component: ‘fast sun’ at ~10.4 and the ‘slow sun’ at ~11 years. OB: That needs a new article. I think it will be found to be consistent with the conclusions I’ve drawn from the work I’ve done on Ray Tomes Z-axis theory. @oldbrew: Oh wow! unimaginable huge energy transport. intriguing, to say the least. Chaeremon: If my hypothesis is near the mark, we are seeing spin-orbit coupling via the HCS. The standard gravitational perturbation theory cannot explain the six minute slowdowns in the spin rates of Saturn an Venus over the last two decades. The link between solar activity and spin rates is mysterious to solar physicists. The Sun has 99% of the solar system mass. The outer planets have 98% of its angular momentum. Let’s get a new discussion going for this. Stand by. 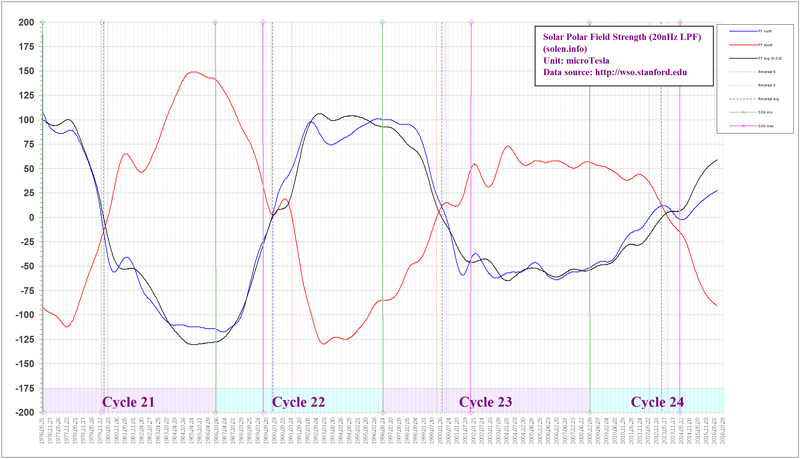 Solar cycle length seems to be involved though. According to your model VUK…Fast sun phase ends at ~2020 with collapse of even cycle upward trend and regime shift into slow sun phase. I wonder if the sun has more than 2 gears?. As looking back into 1400-1600–1600-1700( little ice age), one might describe the solar gear speed as VERY slow and wonder if the sun has an even faster speed than fast..
high amplitude cycling of the displacement angle… J-S 1800-1900 correlates with downward global temp cycle? -RE: the correlation with research on the schwabe triplets..
Have you applied for research grants Tallbloke team to fund your on going research? WC: Have you applied for research grants Tallbloke team to fund your on going research? I conclude the HCS is a result of solar activity(the solar wind) not the other way around. In addition it does not matter which magnetic polarity of the sun the earth spends more time in . In my own hypothesis, for the longer term solar trends, it matters more which side of the HCS the gas giants are than Earth’s passage through it. That article misinterpreted “QBO”, which has a different meaning in solar & terrestrial contexts. I advise caution reading Hockey Schtick blog articles that suggest anything about terrestrial circulation. For example, I recall a recent article about Antarctic sea ice where the blog article author didn’t even appear to be aware of the Humboldt Current. With such gaping holes in basic awareness of circulation, we have no choice but to grit our teeth and filter what we read there. It’s a good source of leads, but some interpretive filtering is necessary. Lack of awareness of the basic topology of terrestrial circulation remains the biggest weakness (it’s actually fatal) in the climate skeptic community. This is especially problematic at wuwt, where the awareness lapse is sufficiently acute to afford the community leaders there opportunity to enforce mass delusion by merely substituting availability for competence & integrity. A policy against hyperactivity would be the easiest way to start correcting this abuse. Lack of awareness of the basic topology of terrestrial circulation remains the biggest weakness (it’s actually fatal) in the climate skeptic community. Where is your evidence of any “lack of awareness” of anything in the climate skeptic community? This is especially problematic at wuwt, where the awareness lapse is sufficiently acute to afford the community leaders there opportunity to enforce mass delusion by merely substituting availability for competence & integrity. A policy against hyperactivity would be the easiest way to start correcting this abuse. the skeptics are not that stupid. We would all appreciate more knowledge of your understanding of this particular “is”! I must say l was just in awe! Fabulous work!!! I liked everything about your paper and all made sense. I also found your explanation of the cause of the schwabe cycle ..
WC: We are subtle about linking paywalled papers, see the first comment on this thread. The 983yr period arises out of planetary orbital rates. Erl Happ had a good handle on terrestrial circulatory topology, along with time & inclination to teach. He became unpopular and got chased out (at wuwt) for expressing his ideas about solar-terrestrial relations. The utility of his articles IMO was that (regardless of whether they otherwise had merit) they forced people to learn circulation. Harry van Loon has a good handle on circulation, but he was chased away by the wuwt solar thought police. Hinnov, Linda A. (2013). Cyclostratigraphy and its revolutionizing applications in the earth and planetary sciences. Geological Society of America Bulletin 125(11-12), 1703-1734. A 61-year period can also be derived from the motion of the J-S synodic in the solar system, using the degrees of angle quoted by Charvatova. Paul V: Great stuff. I’ll feature it as a quickie post to get the juices flowing for the main course. longer time frames ( 10, 100, 1,000, 100,000). Here is a zoom in of global temp(land_ocean) showing cyclical behaviour. – THe shorter schwabe: no 22 , produced a higher frequency temp’ oscillation? -The longer schwabe: no 23, in the 2nd half of the cycle produced longer frequency temp oscillations ? 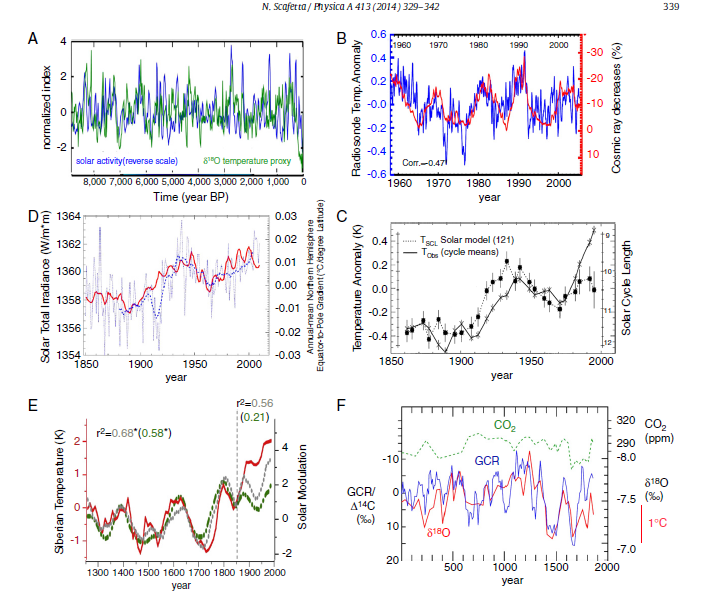 Does solar cycle length determine the frequency of global temperature oscillation ( ENSO?)? It’s tricky due to time lags – may be down to interpretation aka opinion.